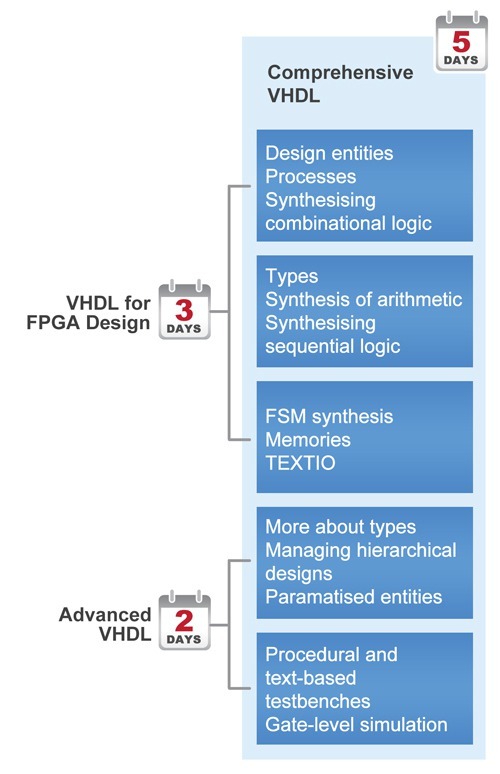 VHDL for Designers (Xilinx) prepares the engineer for practical project readiness for FPGA designs. While the emphasis is on the practical VHDL-to-hardware flow for FPGA devices, this module also provides the essential foundation needed by ASIC and FPGA designers wishing to apply the more advanced features of VHDL covered in the next module. Delegates targeting FPGAs will take away a flexible project infra-structure which includes a set of scripts, example designs, modules and constraint files to use, adapt and extend on their own projects.